I write an occasional publication called Saddlesore, and the emphasis here is on “occasional,” since I haven’t actually thrown one out into the world in quite some time. Maybe a couple years even. But I ride all the time and the adventures never end and from time to time I think I need to write them down, but with all this blogging and art production and teaching and communing with the cats, who has the time for small publications anymore? 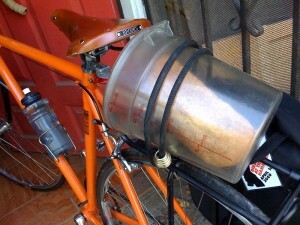 In case anyone’s wondering how to bring freshly baked bread with them on a bike, here’s one solution. A couple days ago I had to return a container to a friend who had too much leftover kale salad. I gladly took the kale off his hands, but protocol requires food containers to be returned with something inside, so I baked some bread. It made a lovely carrying vessel, though I’m afraid the crustiness of the bread may have diminished due to the “greenhouse effect” of condensation forming in the clear container as I rode north. 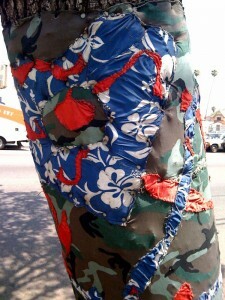 On the way back I stopped to take some photos of this pieced tree covering on Western. 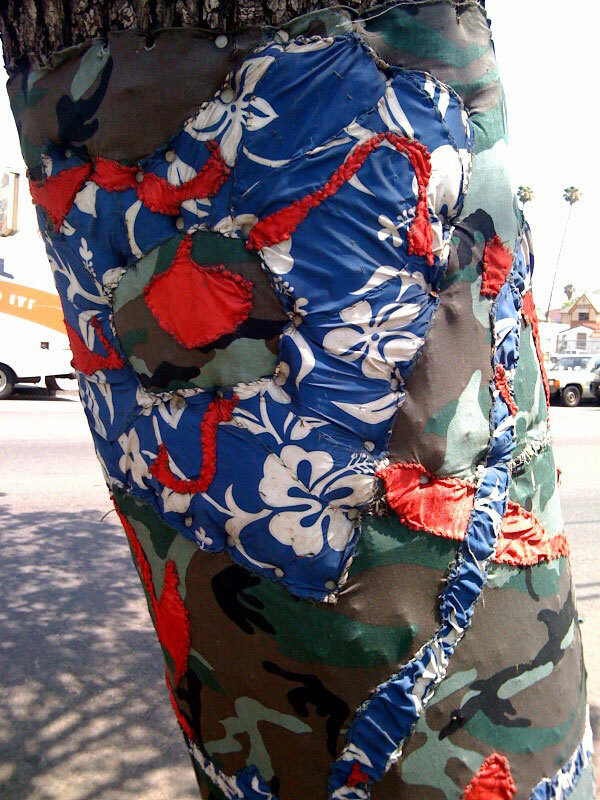 There’s a trend right now among knitters to knit “graffiti” and sew it onto trees as some sort of knitting affirmation, but this guy has been covering trees in my neighborhood for many years. He seems to live in a tent on the sidewalk near these trees, and often he’s sewing when I walk or ride by. Last night I rode up to Echo Park for a haircut. I don’t know how far that is, not too bad. I had heard a rumor about a newly re-opened version of Amok Books somewhere near Pico-Union, so I thought I’d see if I could figure out where it might be and stop by on the way to the haircut. I took Hoover north to Alvarado, and where those streets meet, there’s a large church with a back building that has a star of David on it. I’m always on the lookout for the signs that my people have been kicked to the curb in favor of something else. I pulled up to search for a cornerstone, but seemed like a newish concrete foundation so no way to really tell what was up. No one was around. Later I found out that this church was once called The People’s Temple, run by Jim Jones, who later headed to Guyana for giant mass suicide. I remember when we got the Time magazine that detailed the weirdness. My father was shocked. He told me to always remember this day because it was so strange, so odd, that nothing like that had happened in his lifetime and nothing like that would happen again. I’m paraphrasing, perhaps, but yes, it was a crazy thing to have happen on the planet way back when, and odd to learn that my bike route to Echo Park has such resonant spaces along the way. I almost forgot to mention, too, that the oldest woman in the entire world also lives on my route north, at the corner of Cimarron and Adams, in the Western Convalescent Center. She’s 114 and took the reigns of oldest woman in the world when the previous one died a few months back. I don’t know much about her except that she prays and that she voted for Obama, but I think about her every time I pass by. 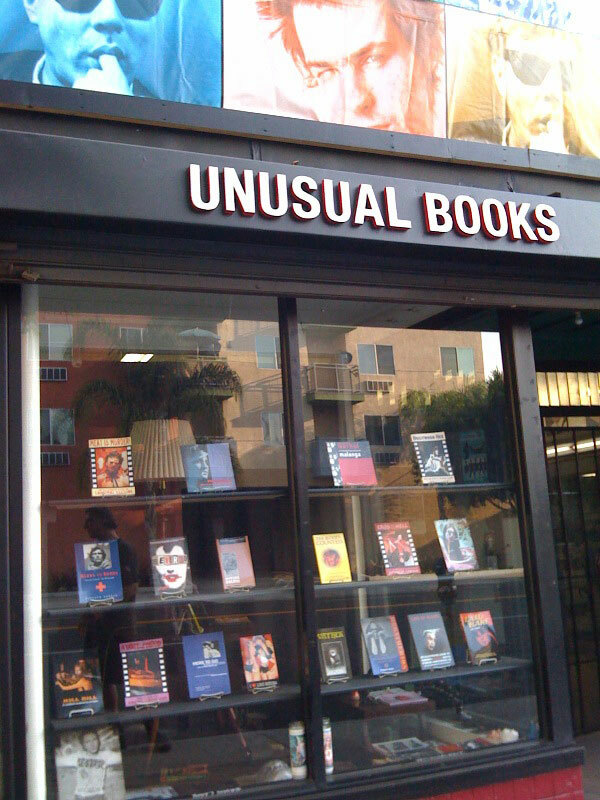 I’d done a few google searches before leaving the house and discovered that the bookstore was called Unusual Books and was located on 7th near Lucas. The google street view made the block look abandoned. The answering machine at the shop said the place was open 12-9, but it was 4pm when I called and no one picked up. I took a chance and stopped by anyhow, and there it was, the front window welcoming, the selection of books inside tantalizing. I brought my trusty steed inside, after watching some random guy outside spitting and thinking that the next spit target might be my bike. The proprietor of the shop, Dan, was super friendly, and showed me his gorgeous bicycle, a vintage sky blue Medici that was in pristine shape. 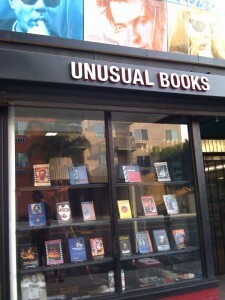 I browsed the odd selection of books, picking up a copy of “Portable Darkness, An Aleister Crowley Reader”. I think “Portable Darkness” is pretty much the best title ever. I have a changing bag for when I need to bring darkness with me for loading 4x5 film, but I’ve never thought of it quite in those terms even though that’s literally what it is. Who doesn’t want to bring the darkness with them? Dan the proprietor gave me the most direct route to Echo Park, which includes a couple small hills, and I made it to see Alice my haircutter only five minutes later than I was supposed to be there. She took off a lot of hair. It’s summer, after all, and good to get rid of that extra weight. On the way home, after dark, I passed a gazillion storefront churches with people inside singing via rickety PA systems to rows of mostly empty chairs. Has Christianity gone karaoke or is this how it’s always been?